Q: What does zazen do for the poetry? Do you feel that there is a relation there that helps somehow in the writing? A: I was very hesitant to even think about that for many years, out of a kind of gambler’s superstition not to want to talk too much or think too much about the the things that might work for you or might give you luck. I’m not so superstitious anymore, and to demystify zazen, Buddhist meditation, it can be said that it is a perfectly simple, ordinary activity to be silent, to pay attention to your own consciousness and your breath, and to temporarily stop listening or looking at things that are coming in from the outside. To let them just pass through you as they happen. There’s no question that spending time with your own consciousness and your breath is instructive. You learn a lot. You can just watch what goes on in your own mind, and some of the beneficial effects are you get bored with some of your own tapes and quit playing them back to yourself. You also realize—I think anyone who does this comes to realize—that we have a very powerful visual imagination and that it is very easy to go totally into visual realms where you are walking around in a landscape or where any number of things can be happening with great vividness. This taught me something about the nature of thought and it led me to the conclusion—in spite of some linguists and literary theorists of the French ilk—that language is not where we start thinking. We think before language, and thought-images come into language at a certain point. We have fundamental thought processes that are prelinguistic. Some of my poetry reaches back to that. 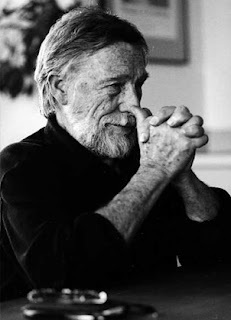 "Gary Snyder on Zazen" was posted March 01, 2008.